Lev Rofman - WSOP Bracelet Winner! Event #12, the $1,500 Pot-Limit Hold'em, began with 535 players. After 25 levels and change, only one was left standing. 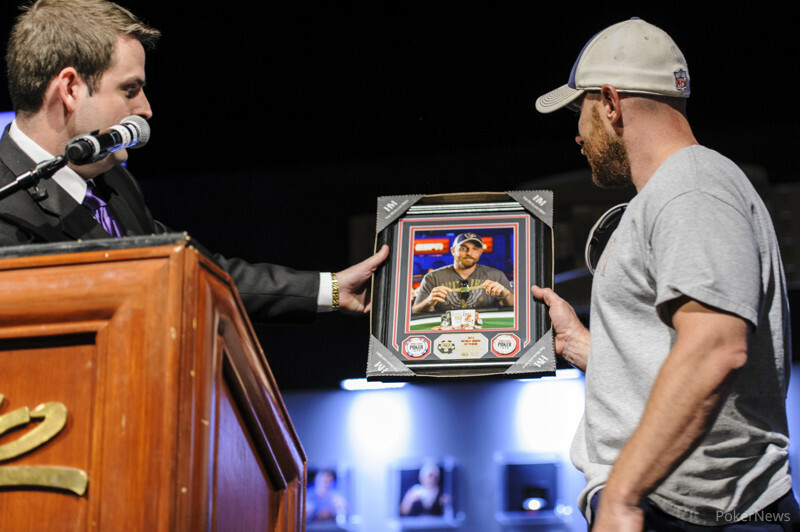 Lev Rofman emerged victorious, topping the field for a first-place prize of $166,136. Rofman began the final table fifth in chips and took a back seat to much of the early action. Short stack Jean-Nicolas Fortin busted in ninth place to chip leader Eric Crain and that was followed by Tim Reilly's elimination in eighth place. Rofman found a key double up against Jaspal Brar before eliminating Nicolas Halvorson in seventh place. 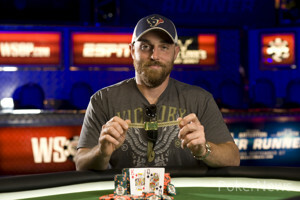 Despite starting the final table as chip leader, it was not meant to be for Eric Crain. 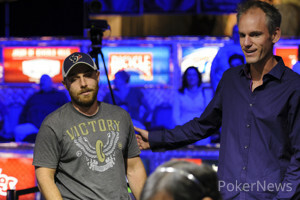 After running into Anthony Harb's pocket aces twice, Crain found himself on a short stack and busted in sixth place to Allen Cunningham. Anthony Harb ran into Rofman's aces to depart in fifth place, and that was followed by Kenneth Shelton's elimination in fourth place. Cunningham took care of Jaspal Brar in third place, giving him a solid 2.4:1 chip lead entering heads-up play. Rofman fought back and closed the gap before Cunningham extended it again. Cunningham would find himself with not one, but two chances to win the bracelet. However, Rofman doubled up both times before sealing the deal on his first attempt as the bigger stack. We hope you enjoyed our hand-for-hand coverage of this final table, and urge you to follow our coverage for the remainder of the summer as more bracelets are awarded. For now, good night from Las Vegas! Hand #236- Allen Cunningham called, and Lev Rofman made it 120,000. Cunningham called, and the flop came . From there, Rofman bet 240,000, and Cunningham moved all in for about 775,000, and Rofman made the call. Both players had king high and flush draws, but Rofman was out in front. The hit the turn, and Cunningham needed an eight, six, or spade to win the hand. The river was the , and that sealed it for Rofman! Hand #231- Lev Rofman called from the button, and Allen Cunningham checked his option. The flop came , and both players checked. The turn brought the , and Cunningham check folded when Rofman bet 60,000. Hand #232- Cunningham called from the button, and Rofman checked his option. The flop came , and this time, it was Rofman who check folded after a bet of 50,000. Hand #233- Rofman made it 120,000 on the button, and Cunningham folded. Hand #234- Rofman got a walk in the big blind. Hand #235- Cunningham got a walk in the big blind. Hand #226- Allen Cunningham limped on the button, Lev Rofman raised pot to 120,000, and Cunningham folded. Hand #227- Allen Cunningham received a walk. Hand #228- Allen Cunningham raised to 80,000 on the button and Lev Rofman called in the big blind. They checked to the turn of a board where Rofman check-called 75,000 to see the river. Rofman check-called another 100,000 from Cunningham. Cunningham tabled for a pair of kings, but Rofman had that beat with for a rivered two pair. Hands #229-230 Each player received a walk. Hand #223- Lev Rofman called on the button and Allen Cunningham checked. They checked to the turn of a board where Cunningham bet 50,000. Rofman called and the turn followed. Cunningham checked to Rofman who bet 125,000. Cunningham folded. Hand #224- Allen Cunningham raised to 90,00 on the button and took down the big blind. Had #225- Lev Rofman raised to 90,000 on the button and Allen Cunningham three-bet the pot to 270,000. After a few moments, Rofman stuck in his remaining 600,000 total. Cunningham called. The flop came down to pair Rofman and give him the lead. Cunningham found no help from the turn or river, doubling up Rofman to 1.2 million. Cunningham is slightly ahead with 1.21 million. Hand #217- Allen Cunningham gets a walk. Hand #218- Cunningham made it 120,000, and Lev Rofman bet pot, moving all in. Cunningham called. Rofman was in great shape, and his double up was all but assured when the flop came . Cunningham picked up river outs when the hit the turn, and he wasnow looking for a five. However, the river was the , and Rofman scored his double up. Hand #219- Rofman made it 120,000 on the button, and Cunningham called. The flop came , and both players checked. The turn brought the , and Cunningham bet out 150,000. Rofman folded. Hand #220- Cunningham raised to 120,000 on the button, and Rofman folded. Hand #221- Rofman made it 120,000 on the button, and Cunningham folded. Hand #222- Rofman got a walk in the big blind. Hand #212- Allen Cunningham called, and Lev Rofman made it 120,000 to go. Cunningham folded. Hand #213- Cunningham got a walk. Hand #214- Cunningham made it 80,000 on the button, and Rofman called. The flop came , and both players checked. The turn brought the ,and Rofman bet 160,000. Cunningham called, and the river brought the . Rofman checked, and Cunningham fired 300,000 into the middle, which got Rofman to fold. Hand #215- Rofman called, and Cunningham checked his option. The flop came , and Cunningham fired 50,000. Rofman called, and they checked down the on the turn, and the on the river. Hand #216- Cunningham called on the button, and Rofman made it 120,000. Cunningham called, and the flop came , and Rofman quickly bet pot, 240,000, leaving 280,000 behind. Cunningham thought for about 15 seconds before moving all in, and Rofman tanked for about 45 seconds before folding. Hand #207- Lev Rofman raised to 80,000 on the button and and Allen Cunningham called to see a flop. Both checked, the turned, and Cunningham check-called 105,000. Both checked the river and Cunningham won the pot with fort a pir of fours. Hand #208- Allen Cunningham raised to 80,000 on the button, Lev Rofman called from the big blind, and the flop came down . Rofman check-folded to Cunningham's bet of 75,000. Hand #209- Walk for Allen Cunningham. Hand #210- Walk for Lev Rofman. Hand #211- Lev Rofman raised the pot and took it down. Hand #200- Allen Cunningham limped on the button and Lev Rofman checked. The flop fell and Rofman check-folded to a bet from Cunningham. Hand #201- Lev Rofman raised to 90,000 on the button and Allen Cunningham called from the big blind. They checked to the turn of a board where Cunningham bet 100,000. Rofman gave it up. Hand #202- On the button, Allen Cunningham limp-called a raise to 120,000 by Lev Rofman in in the big blind. The flop came down and Rofman bet 225,000. Cunningham folded. Hand #203- Lev Rofman limped on the button, Allen Cunningham checked his option, and the flop fell . Cunningham bet 40,000, Rofman raised the pot, and Cunningham folded. Hand #204- Lev Rofman received a walk in the big blind. Hand #205- Lev Rofman raised to 80,000 on the button and Allen Cunningham called from the big blind. They checked down a board and Cunningham won the pot with . Hand #206- Allen Cunningham limped on the button and Lev Rofman checked. They checked to the turn of a board where Cunningham bet, receiving a fold from Rofman.